Home | Rock the Ropes at the San Francisco Zoo! Rock the Ropes at the San Francisco Zoo! 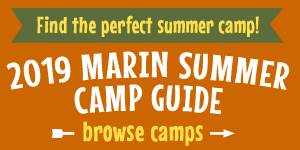 Through June 14, 2015, kids ages 4 to 14 can experience the Rockin' Ropes Adventure on weekends and school holidays in the San Francisco Zoo's Pachyderm Building. Kids can zip, swing, jump, step, and slide around this challenging elevated ropes course. It's a fun addition to your family's visit to the zoo! We had a chance to check out the Rockin' Ropes Adventure last weekend, and the kids had a blast. The course offers plenty of challenges for all age levels and takes approximately 15 to 20 minutes to make your way around it, and you get to go through twice. My kids really loved the feeling of being up high above the ground, and enjoyed the challenge of maneuvering around the various obstacles and making their way along the narrow ropes. The Rockin' Ropes Course requires an additional admission fee of $7 for general admission visitors and $3 to $5 for Zoo members, depending on level. You can check out the Rockin' Ropes schedule for each week on the zoo's online calendar of events. Afterwards, we had a great time exploring the zoo and paying visits to some of our favorite animal inhabitants, like the giraffes, rhinos, and gorillas. We also had a chance to play on the awesome new Eleanor Friend Playground and ride the zoo's historic 1921 Dentzel Carousel. It's a fantastic place to spend the day. The San Francisco Zoo is open daily from 10 am to 5 pm; the last admisison is at 4 pm. Admission is $17 for adults 15 to 64, $14 for seniors 65 and over, $11 for children 4 to 14, and free for kids 3 and under. Parking in the zoo's lot costs $8 on weekdays and $10 on weekends. San Francisco residents, with proof of residency, and retired and active-duty military personnel pay reduced admission fees. The SF Zoo is located on Sloat Boulevard at the Great Highway in San Francisco (94132). For more information on the Rockin' Ropes course and all the zoo has to offer, visit www.sfzoo.org.